Shadow and Betrayal was another book that I picked up at a second hand book stall, and I had a real hankering for some proper fantasy at the time. I'd just started uni and my reading requirements were a far sight from the material that I had hoped to read. So when I found this book, with its vague yet obviously epic fantasy blurb, I couldn't resist. Finally getting round to reading it now, I was reminded that this is an omnibus, collecting the first two books in a quartet named The Long Price. So what I actually had, in one nice package, was a bit of a question. Should I review this as Shadow and Betrayal, or should the books contained be reviewed separately? As you see here, I plumped for the former, as I thought that the two volumes would be similar enough in theme and plot for the review to run smoothly. I may have underestimated what I could take on. As stated above, this book combines the first two books in a quartet, the first named A Shadow in Summer and the second A Betrayal in Winter. They take place in a world where the most prominent merchant cities have risen to power through the presence of the poets, sorcerers who wield concepts-made-spirit known as andat, and the iron rule of the Khai, emperors who must earn their seat through ritual fratricide. The two main characters know this world intimately: Maati Vaupathai, a student poet, and his first teacher Otah Machi, who was offered the power of the poets but refused. A Shadow in Summer sees them in Saraykeht, where they become involved in a plot to cause the fall of the city by bringing about the escape of the resident poet's andat, Removing-The-Part-That-Continues (also known as Seedless). 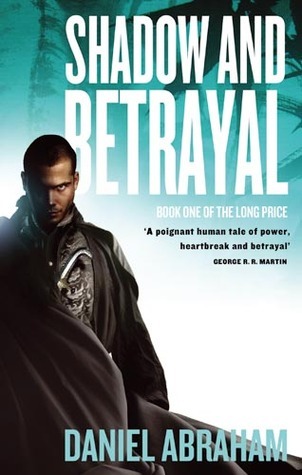 Then in A Betrayal in Winter, they find themselves both involved in the bloody, conspiracy-laden succession of the Khai Machi when someone outside the family dispatches one of the heirs, despite being against centuries of tradition. It took me a little while to get into each of these books, but by their respective ends both had me absolutely hooked. Honestly, where do I start with all the things that the first half of The Long Price gets so right. I suppose the first thing that comes to mind is the world-building. Firstly, it isn't just a rehash of your standard fantasy epic, instead taking more of an Eastern approach to the setting. In addition, it paints the social structure of this culture in minute detail whilst still being largely unobtrusive; from the hierarchy of the ruling classes to the local customs and even to the level of formality in their gestures and honorifics, I don't think that there's an area that was missed out. Of particular interest in the setting is the presence of the aforementioned andat. They are the spiritual and physical incarnations of a concept that the poet wishes to take advantage of. But a being of power like that cannot simply be summed up in a phrase, so the poet must define its other characteristics before being able to wield it. And you cannot resummon an andat without the difficulty and danger increasing, so if the poet suffers as a result of their andat they must live with it. It's a magic system with some really interesting and unexpected consequences and I'm really interested to see how it's continued in the rest of the quartet. The second thing that I love is the moral complexity. The problems in both books are such that there is a power manipulating from the shadows, but an open and large scale confrontation with them is not an option because it would result in the death and suffering of thousands of innocents who have no interest in the machinations of a few of their ambitious leaders. Additionally, the "villains" in both books are written so that their motivations are understandable enough that you can't wholly condemn them. Their actions may be terrible and deserving of due punishment, but I couldn't help but still really like them, as conflicted as that made me feel at times. The final thing that I really like is that there is a really interesting examination on women in society, both in terms of reproductive rights and inheritance. I was especially impressed that Abraham managed to include a depiction of abortion that walks the delicate line where it is neither trivialised or demonised. Considering that it's an issue that makes people very emotive, it's treated with a measure of respect that I so rarely see. The only thing that I am still a little dubious about is that there's a time skip of over a decade between the two books, during which the characters have changed drastically enough that it's like watching entirely different people at times. It was a little jarring at the beginning of A Betrayal in Winter when you realise just how much time has passed between the two novels. Not a huge issue, but it does bother me a little.